Mole Scram -- America's Finest Mole Repellent -- is a granular, organic, biodegradable, environmentally safe mole repellant that is guaranteed to keep moles out of your prized gardens, yards and landscapes, while not being offensive to humans. Mole Scram was developed as a highly effective response to the damaging tunnels caused by foraging moles in the southeastern United States, where one of the densest mole populations exists in the country. 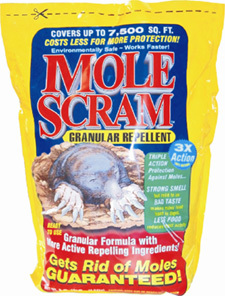 Mole Scram is now widely used across North America. Mole Scram will not harm animals, the environment and, most importantly, you and your family. Blended from selected organic components, Mole Scram is used as a spreadable repellent -- applied across your landscape, yard and gardens -- and is not water-soluble. Mole Scram will keep moles out of your yard because it coats the worms, grubs and other insects moles eat with the disagreeable flavor of castor oil. Mole Scram changes Mole behavior. 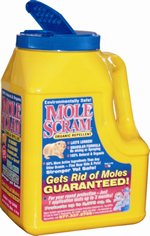 Mole Scram lasts longer than competing sprays. Apply Mole Scram any time of year! Apply Mole Scram now to stop the moles that are eating your plants. Mole Scram can be distributed by hand or with a spreader. Mole Scram will keep moles out of your yard, gardens and landscape when used as directed. Mole Scram will keep moles away for good but will not harm the Moles.